The city of Florence is surrounded by striking hills, crossed by a maze of narrow lanes where only one vehicle can pass at a time. A magical place, little known but much loved by the Florentine people. Standing tall in this rich landscape of vegetation (olive, cypress and pine trees) are magnificent nineteenth-century villas and the famous Abbey of San Miniato al Monte. 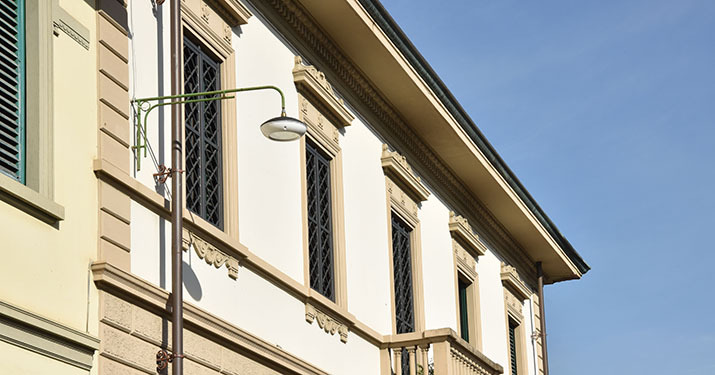 To illuminate this unique place, Silfi, the company that has managed lighting in Florence for over 50 years, opted for the new ‘Light 103’ by Neri. With this product, an evolution of ‘Light 104’ designed years before for Silfi, the old street lighting fixtures, unsuitable for so unique a location, were replaced. The old discs with antique-style lamps installed on cast iron brackets were preserved. The LED version of ‘Light 103’ has a large white reflector in PMMA which recovers the luminous flux reflected by the glass, guaranteeing high optical efficiency and reduced glare and reaching an efficiency of up to 123 lm/W with an optical package comprising 5 geometries. The body entirely made in cast aluminium and extra-clear transparent glass is equipped with an upper frame in Neri Grey, whereas the lower frame is white in colour. The large internal dimensions allow for optimal irradiation dissipation thanks to the new anodized dissipater. The LED module can be removed easily as it uses the new fast demounting system which does not require the use of tools, unless when disconnecting the isolator switch cables.